Carli Lloyd became the sixth woman in U.S. Soccer history to score 100 goals. When the moment arrived, Carli Lloyd allowed it to happen. She smiled amidst the crowd's cheers and teammates' congratulations. 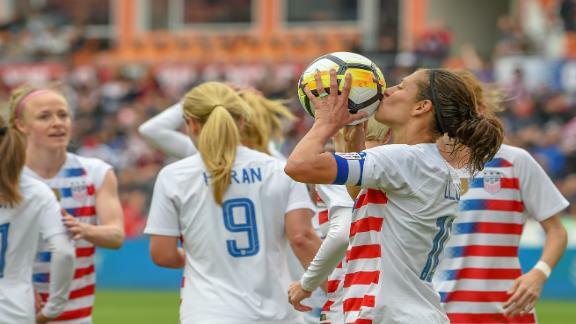 The United States women's national team captain kissed and held aloft the ball that she seconds earlier headed over the line for her 100th international goal. 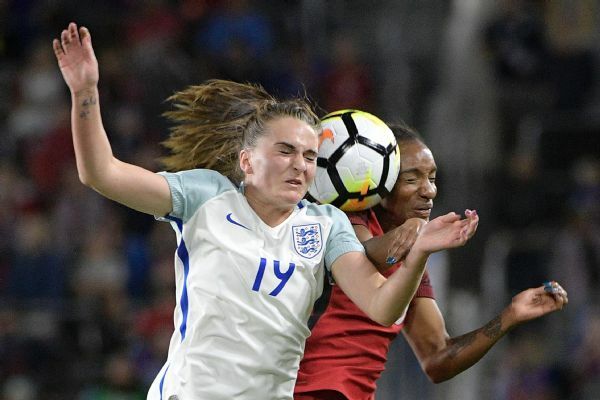 She kept a firm grip on the ball, too, despite an opponent's halfhearted effort to reclaim it and restart play as Lloyd jogged to the sideline. She knew what it represented as she entrusted it to a staff member for safekeeping. More than merely a round number, No. 100 means that only four Americans have scored more goals than Lloyd: Michelle Akers, Mia Hamm, Kristine Lilly and Abby Wambach. Lloyd's career of heroics, the Golden Ball in a 2015 Women's World Cup capped by a hat trick in the final and two gold-medal-winning goals in Olympic finals, long ago placed the midfielder alongside those names in any conversation about a Mount Rushmore of the U.S. women's national team. It's still nice to have the statistical harmony Sunday provided to round out the resume. 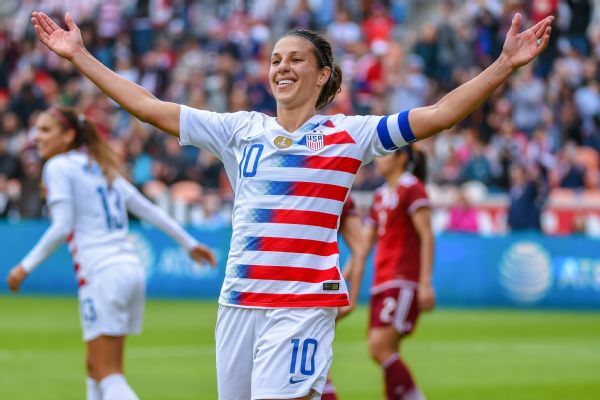 Just for good measure, Lloyd's 100th goal, if not among her most memorable in terms of degree of difficulty, was the decisive one in a 6-2 victory against Mexico that saw the U.S. come from behind for the first time this year. "I think I could have 10 careers and not get that many goals," Megan Rapinoe said during a TV interview. To celebrate Lloyd, and ask her to be celebrated, somehow seems the wrong tribute. To ask her to pause and reflect feels discordant. It ignores the single-minded focus on forward progress by which she defines herself. The more fitting homage is that even now, Lloyd still seeks out doubt as to what is possible. Even in this moment, she is less interested in basking in the past than fighting for her future. "It's obviously a great milestone, but I've got a lot of things I still want to accomplish in my career," Lloyd said in a TV interview. "It's pretty cool, it's an honor. But as people know me, I'm moving on to the next." 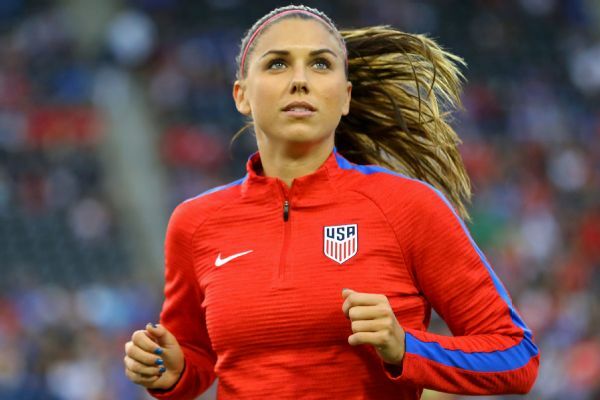 She said much the same of what was then the impending milestone after she scored her 99th goal three days earlier against Mexico in Jacksonville, Florida. Except she said it that night with what felt like the pent up energy, and accompanying frustration, of someone who played fewer than 40 minutes and therefore missed out on more than 50 minutes of potential progress. "I've got it mapped out in my mind," Lloyd said then of her mindset. "And in 2020, everybody will know what those maps look like. But it's there. It's in the back of my mind. I know that the best is yet to come with me. I know I have a lot more to give. I know that I can be on that field, impacting that field daily. I feel really good, I feel as fit as I've ever been, I feel as sharp as I've ever been. I feel I'm playing the best football, as far as tactically out there. It's obviously a great milestone, but I've got a lot of things I still want to accomplish in my career. "It's really all there. I just need to get in sync, need to get games under my belt." There is perhaps the most interesting question to be answered in the coming months. First in World Cup qualifying in October, which CONCACAF announced Sunday will send the U.S. in Cary, North Carolina, for group play before potentially advancing to a semifinal and either the final or third-place game in Frisco, Texas. But more consequentially, the World Cup next summer in France and even the 2020 Olympics in Japan, events Lloyd has stated will precede her retirement. When the United States opened the 2015 World Cup, Wambach had days earlier celebrated her 35th birthday. In other words, she was younger at that moment than Lloyd was Sunday when she scored her 100th goal. Yet one of the storylines of that tournament was Wambach settling into a role off the bench. 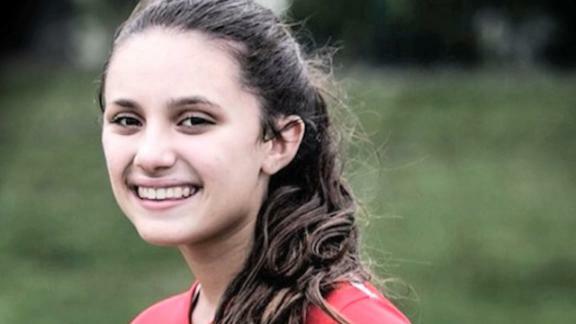 She started in two of three group games but only one of four games after that and played only sparingly off the bench in the semifinal and final. Suffice to say, that isn't a role Lloyd has volunteered for just yet. 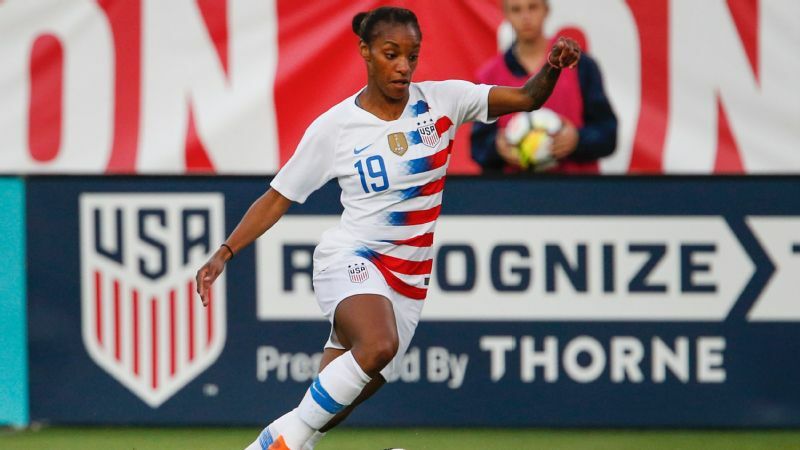 Lloyd started and played all 90 minutes against Mexico on Sunday, the second time this year she did so. She also started the opening game of the SheBelieves Cup against Germany but came off after a little more than an hour. In Jacksonville, coach Jill Ellis said there wasn't any bigger picture plan to manage Lloyd's minutes. She went on to note that she was pleased with how Lloyd impacted that game after coming on as substitute in the 53rd minute. Noticeably missing was any suggestion that the role was temporary or a concession to other assessment objectives. Missing was any suggestion it was anything other than current reality. And that reluctance to expand very much on Lloyd's role isn't new. "I know every player is gunning for a starting spot," Ellis said when asked about Lloyd before the U.S. played Denmark to open its 2018 schedule. "But where I'm at with the team right now is I feel good about the group and just evaluating and assessing players." Carli Lloyd already has a Golden Boot, Women's World Cup title and Olympic gold on her resume. But she still has more she wants to accomplish. If Lloyd plays behind the forward line, and presumably either Julie Ertz or Andi Sullivan start in more of a holding role in the three-person midfield, that would leave just one spot for Morgan Brian, Lindsey Horan or Samantha Mewis. That may not be enough for Ellis. No one, save Sauerbrunn, played more minutes for the U.S. a year ago than Mewis, who has yet to play this year because of injury. And Horan, though she left Sunday's game with an apparent injury, has started every U.S. game this year. All 25 years old or younger, those three combined have scored 82 fewer goals than Lloyd, but they appear equals in the current competition for starts and minutes. Lloyd has 11 starts and nine appearances as a substitute since the start of 2017. Some of that is related to the ankle injury she suffered after she returned from a stint abroad with Manchester City last year. But between 2011 and 2016, a span that included two World Cups and two Olympics, she started 122 times and came off the bench 10 times. Lloyd seeks the minutes she genuinely believes will allow her to be not only the player who scored 100 goals, but the best all-around version of herself she has ever been. Ellis appears intent on spreading those minutes around in case that isn't the case by the time the World Cup arrives. "The way we're playing [with NWSL's Sky Blue] is going to translate to here," Lloyd said after Thursday's game against Mexico. "So I'm enjoying every bit of it at Sky Blue. But of course, finding minutes at the international level and getting into rhythm, a consistent rhythm, is obviously something that any player needs, really, at this level." Lloyd's 100th goal was worth celebrating. But to appreciate the player who reached that milestone, the fight she still wages is far more revealing. "For me, it's day by day at the moment," Lloyd said Thursday. "But I've got that goal at the end that I'm striving for." She wasn't talking about the one that came Sunday afternoon in Houston.